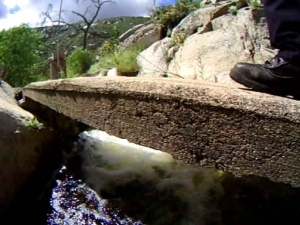 November 23, 2010 (San Diego’s East County) – For this video adventure, I took a boat ride on El Capitan Reservoir to locate the Conejos Creek diverting dam (South Fork Feed) to the Cuyamaca Flume—once a major water source for our region. What I found was only half the dam, but still well preserved. The diverting dam is tucked away in scenic mountains 10 miles east of downtown Lakeside, accessible by boat--or a long walk on the dizzying flume trail along the east side of El Capitan Reservoir. My reward was breath taking, to see this part of history that was once part of the Cuyamaca Flume. 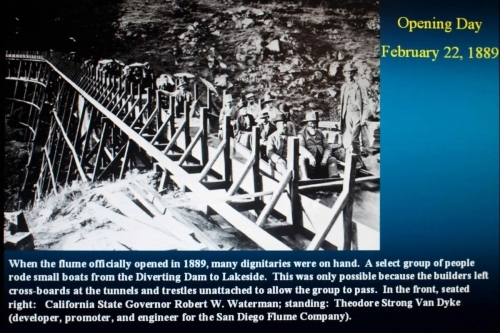 Built by San Diego Flume Company to provide water to the eastern region of SD County, the Flume officially opened in 1889. Eight hundred horses and mules, 9 million board feet of redwood lumber, miles of rough back country, eight tunnels and 315 trestles. It was 1885 and a thirsty San Diego was demanding more water. Before then, then only windmill-driven wells supplied water to small gardens and citrus groves in the hot summers. 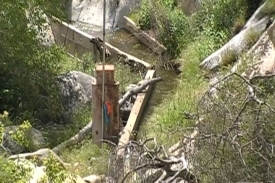 The solution was to capture water in the East County mountains more than 50 miles from San Diego. I n 1886 the San Diego Flume Company was formed, engineered by Theodore S. VanDyke and financed by Joseph W. Sefton Sr. Work began with the building of the Cuyamaca Dam and two diverting Dams one in Boulder Creek the other a much smaller one in the Conejos Creek and a six-foot-wide ,16-inch-deep, 37-mile-long wooden flume to Grossmont, then through a ditch to several holding ponds. One holding pond can still be seen behind Anthony's Fish Grotto in La Mesa. The Flume eventually made its way to University Heights Reservoir. 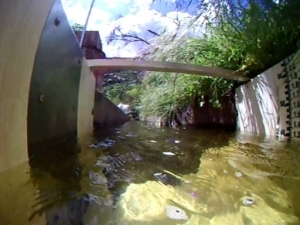 Four years later, in 1889, the Cuyamaca Flume officially opened. Many dignitaries were on hand for a ride down the flume from the diverting dam to Lakeside, including the Governor of California, Robert W.Waterman. What a ride it must have been! Ladies with their Chinese parasols and picnic baskets and gentlemen in business attire and top hats floated along, high above meadows and across canyons on the trestles, also plunging into the dark tunnels along the way. The flume-riding sport became so popular that owners connected trains of four and rented them out. Particularly exciting were the night rides among the young who dared a ride in the darkness. I would just about give anything to have been a part of this wonderful history in our East County. I suppose I'll just have to dream of a simpler time not to long ago and reflect on how important this flume was to our community. Nicely done. The terrain there isn't easy, thanks for doing the difficult legwork getting the photos and video and for recounting this interesting part of our water history. This adventure of yours is really very exciting. I can see it in the pictures you've taken. I am sure your photographer is an expert. Very nice shots. Job well done!